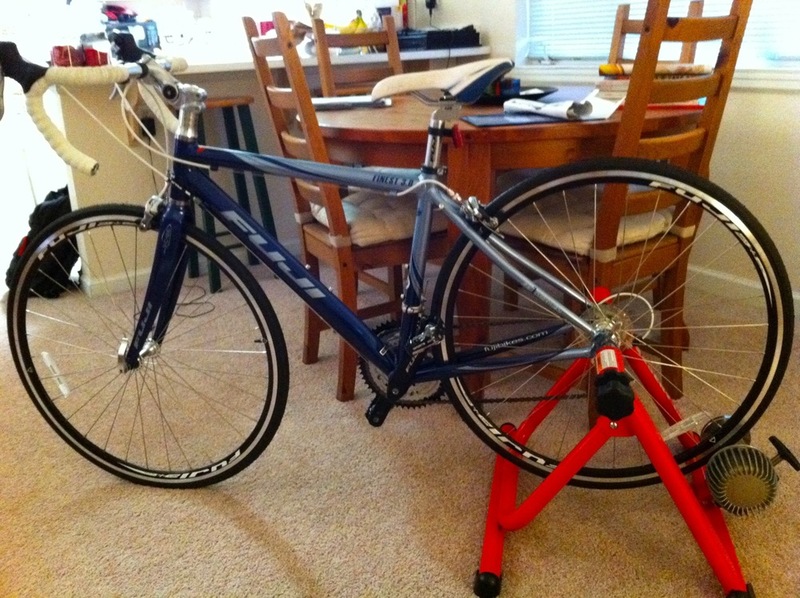 Oh I use it all the time...on the trainer, but it has yet to be taken for an outdoors ride. You see, I am terrified of it. Every time I get brave, I google photos that random people have posted of photos of their scrapes and bruises from falling off a bike and it freaks me out. 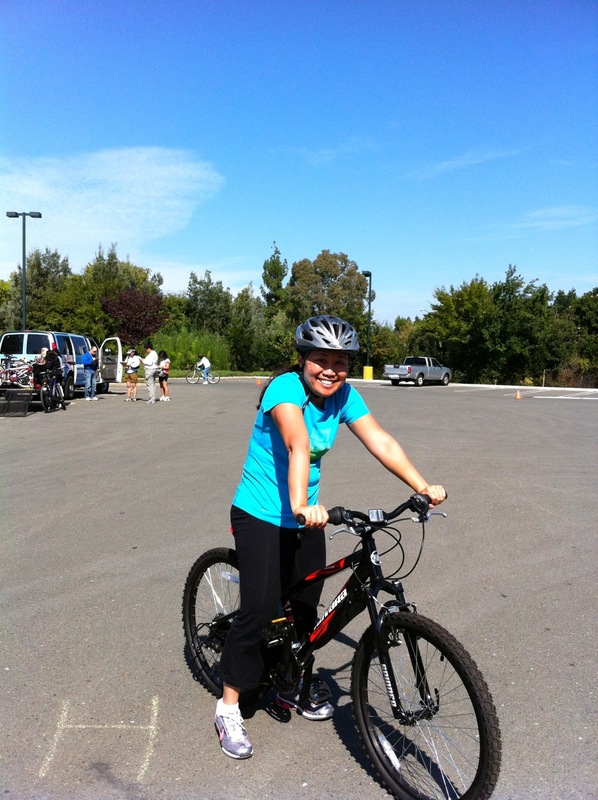 Shortly after buying my bike last Fall, I took a "How To Ride A Bike" class from REI's Outdoor's school. It was an adult class that was surprisingly full. And even more surprisingly, I had more "bike experience" than most others did in that class. The class used mountain bikes and started us off without pedals. We just learned to scoot along, then practiced balancing and then eventually the pedals were added back onto the bikes and we were riding around the REI parking lot. I guess that old saying of, "You never forget how to ride a bike." is true. But sadly, after taking that class, I didn't keep it up. Being that I signed up for a Sprint Tri in June, I figure it's about time to get more serious about learning how to ride a bike again. 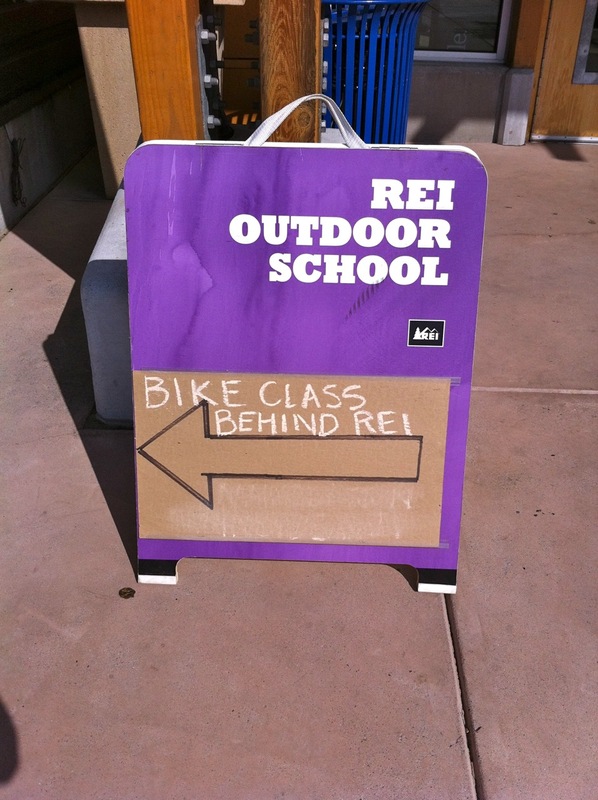 Luckily, the "How To Ride A Bike" class is the one REI Outdoor class that you can take as many times as you wish, free of charge. So I took it again over the weekend. This time, there were only 6 people in class with 2 instructors - all women. We met at Coyote Point and went thru the same progressive steps as the last class and thankfully, I picked it up again in no time. Being that this class was much smaller, I was able to spend some time picking the brains of both instructors. One is an avid cyclist and the other is an Ironwoman. They both gave me great advice on how to get started and encouraged me to keep at it. The class was supposed to be 4 hours long, but after 3 hours I got pretty bored of riding around the parking lot so I left to get some lunch and rest up for an afternoon run. Both instructors assured me that I was ready for the next class, the Bike Skills class, where they teach you basic bike handling skills. I'm signed up to take it in about 3 weeks, then after that will take the Introduction to Road Cycling class. I's exciting to learn something new, yet it's intimidating at the same time. But I just keep telling myself, "if I can drive a stick shift, surely I can learn how to ride a road bike." - right?